1) Fully drain (overnight is best) transmissions and final drives, and then re-install plugs before packing. 2) Pack the component securely, double-boxing if possible. Some tips are provided below. 3) Enclose a note with your contact information, a summary of the repair needed, and the address to which your package should be returned. Even if we have talked, emailed, PM'd and texted... do this, so the right information is available when we need it. Note: I strongly recommend you avoid using the US Postal Service. UPS and FedEx are more likely to actually deliver your package to me at this location. You need to be VERY careful when packing transmissions and similar items. You have to assume that the package will be thrown considerable distance no matter which carrier you use. A box within a box is the best way to go. 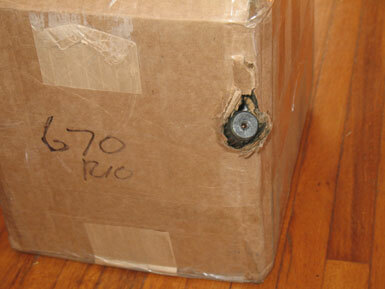 Make sure that the contents are not loose within the box or they will make their way through the wall eventually. Cylinder heads should be individually wrapped, taped, and then bound together so they don't bang edges against each other during handling. It's easy to underestimate the requirements for packaging heavy items like transmissions, cylinder heads and final drives. Unfortunately these are expensive items and there are real consequences to you when an empty box with a hole in the side arrives at my shop. Contents tightly secured within the inner box. This package is basically perfect. 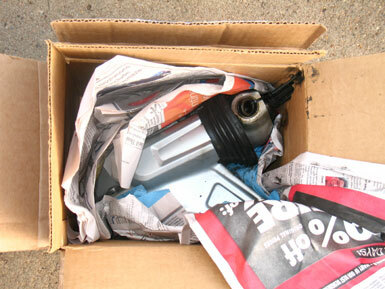 The transmission is clean and wrapped in plastic so that any oil that leaks out won't stain the box. 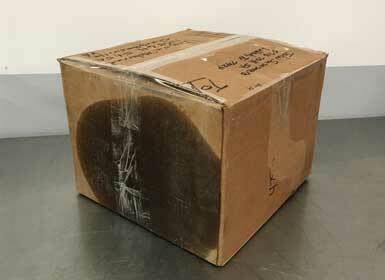 Many shippers will not deliver a box that's leaking fluid. The wrapped transmission is tightly packed into the inner box. 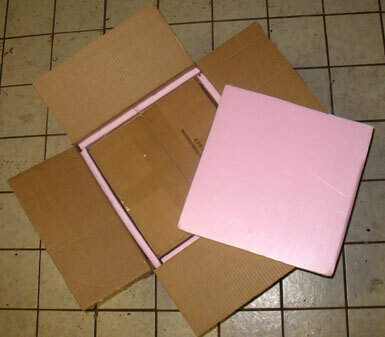 The reason you see so much packing on one side is that the mounting flange is much longer than the body; the flange is under the fives sheets of pink material. The inner box is securely packed into the outer box. The reason two boxes are used is that the extra wall provides support for the inner packaging. Sharp blows top the package bear on the inner wall, which is cushioned against the outer wall by the second layer of packing material. Additionally, if the outer box gets torn the contents are still fully contained. Even with two boxes, the contents must be immobilized so they don't strike the wall of the box. Drain it! Really, drain it! Drain the oil. Not for fifteen seconds, not unitil "most of the oil" has come out, but until nothing has come out for a while. Do this while the component is still installed, or support it in its normal orientation, so that the drain plug is actually at the bottom. It doesn't cost you anything to drain it overnight; you have my permission. It's very important to immobilize the contents in their packaging. Styrofoam peanuts and paper are not that useful, as the object will migrate through. 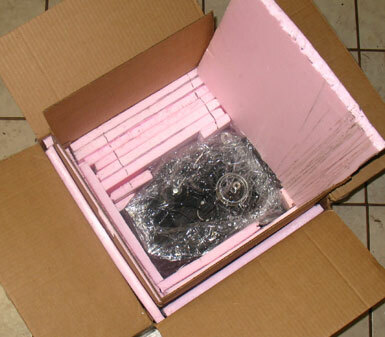 The best way to pack items like final drives and cylinder heads is to wrap in bubble-wrap and tape it like a football. That should go into a box, which is preferably wrapped in another layer of packaging and put into another box. You have to assume that your package will be thrown. If you don't feel comfortable throwing the package down your driveway, it's not packaged well enough.